President Muhammadu Buhari with a delegation of Vlisco Group led by the CEO, David Suddens, and others at the State House in Abuja on November 8, 2018. President Muhammadu Buhari has pledged the commitment of his administration to revive the ‘good old days’ when the cotton and textile industry employed hundreds of thousands of Nigerians. He made the promise on Friday when he received the CEO of Vlisco Group, Mr David Suddens, at the Presidential Villa in Abuja. The President, who welcomed the proposed investment of $200 million by the company in the country, was optimistic that it would, in turn, create about 700,000 jobs for the people. “I am very much aware of your company’s effort, especially your investments in the textile industry and, it is one area that we are trying to develop because it will create employment and boost agriculture,” President Buhari was quoted as saying in a statement by his media adviser, Femi Adesina. He added, “To get cotton to grow again in the country is like going back to the good old days when the textile industry used to employ more than hundreds of thousands of people. President Buhari further reiterated Nigeria’s commitment to forging a stronger economic partnership with the Netherlands. He also assuring the Dutch investor that the Nigerian authorities would continue to do the utmost to keep smugglers at bay at borders. In his remarks, Suddens informed the President that the 172-year-old company plans to use cotton grown in Nigeria for production. “For the total supply chain for cotton, textile and garment industry from weaving, spinning, printing to retail, we want to use Nigeria cotton and we have already started to encourage the creative industries in the country to find a voice and give them a platform across the world,” the Dutch investor added. 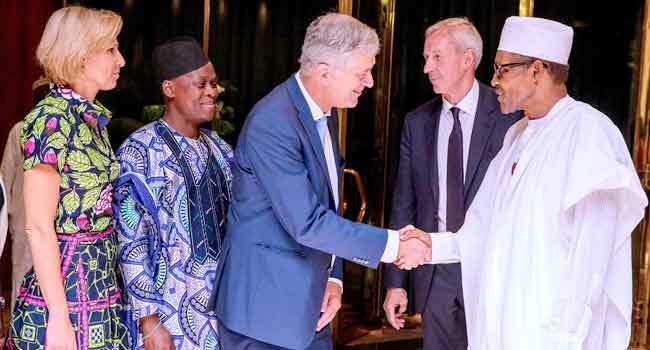 On his part, the Dutch Ambassador to Nigeria, Mr Robert Petri, told President Buhari that the company’s visit was a follow-up to his successful visit to the Netherlands in July, during which he met with Chief Executive Officers of Dutch companies. “Also during that visit, a Memorandum of Understanding was signed between our two countries seeking more intensified cooperation. “After that visit, there were more successive visits by top Dutch officials to Nigeria. This shows that we are seriously committed to furthering our collaboration,” Petri said.